One of the more festive winter fashion trends I love is the reemergence of jacquard fabrics. The texture, shine, and colors scream holiday cheer, and when you get it right, it’s absolutely stunning! A dress is a great option for working this trend into your holiday wardrobe. There are so many gorgeous jacquard fabrics in dresses and it can be a different and welcome change up to all the velvet and sequins. (although I LOVE these fabrications as well, don’t get me wrong!) I think a blazer or a great pant, like I have done here, can be another fun and daily wearable option to add into your closet. A blazer is great to wear with jeans and a simple top or even with slacks for business. The pant can be great for work or a meeting but then can be dressed up for a holiday party, as an alternative to a dress. If you had a great suiting option, that is tasteful and subtle, that could be striking! Great for holidays, weddings, or nights out. This rich fabric will add depth and beauty to your wardrobe. Don’t be afraid to mix your textures together when working with jacquards. 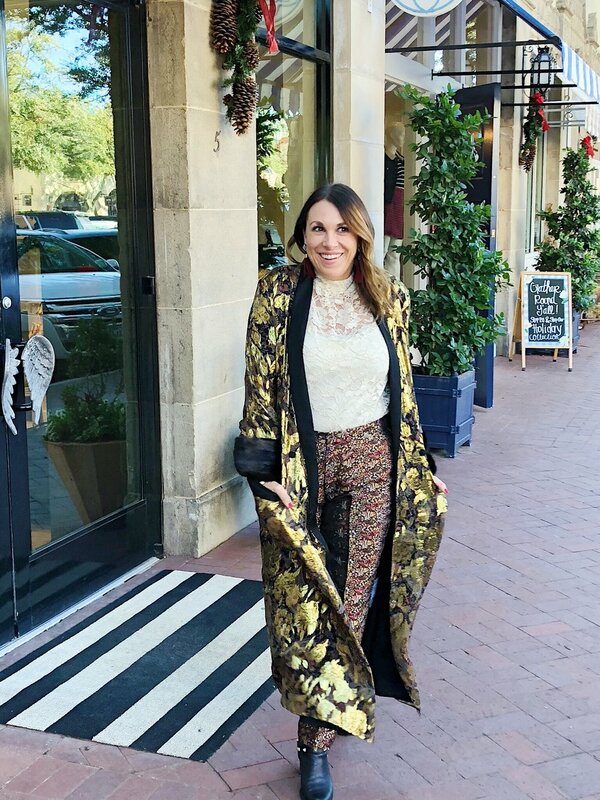 For example, in my look, I have the jacquard in my pants and then have the metallic kimono and a lace top layered underneath. Here I have played with small textures and mixing prints for a unique look. Find pieces that accomplish the (any) trend goal in a way that works for you! That will be how you nail any trend. Is another great way to work in a jacquard or uniquely printed fabric into your wardrboe. It can be put over dresses, with a slack or even a distressed jean.